Every year Jim and I are in Leadville we debate about whether to volunteer on the day of the bike race. Should we or shouldn't we?? Each of the nine? ten? 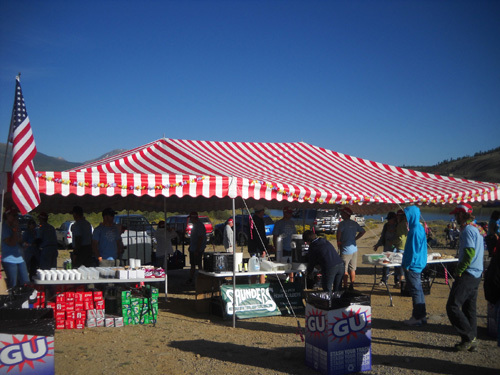 (can't remember) times we've been here, we have volunteered on race day -- at the finish line once, at a crew access point on the course at 45/55 miles a couple times, and at least half a dozen times at the Columbine Mine aid station at the 50-mile turnaround. Our debate was no different this year. Neither was the outcome -- once again, we decided to work the bike race. And once again, we had the same selective memory that made us forget most of the reasons we swore the previous year that we'd "never do that again." Volunteers and crews assist riders at the Twin Lakes aid staton. < sigh > Will we ever learn?? I think you can see where this is going. I'll try not to get too whiny about it. My main goal in this entry is to provide insight and information that potential new LT100 bike riders, crews, volunteers, and spectators can use in the future. If that doesn't interest you, just scroll down and enjoy the pictures I took during the race! 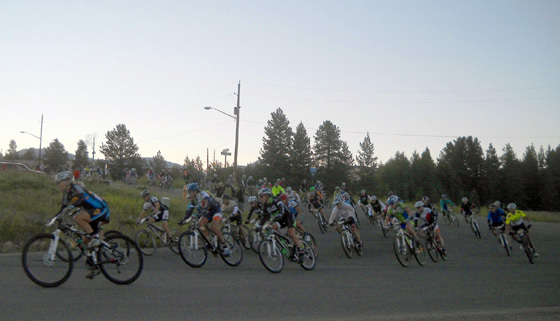 The 18th annual Leadville Trail 100-mile bike race began at 6:30 AM on Saturday, August 13. Jim and I were up an hour before that to get ready for our jobs at two of the aid stations. The sky was clear and just getting light at the start of the race. Our thermometer read 39 F. but temperatures would reach at least the mid-70s in the valley by afternoon. Sunrise brightens the tops of Mt. 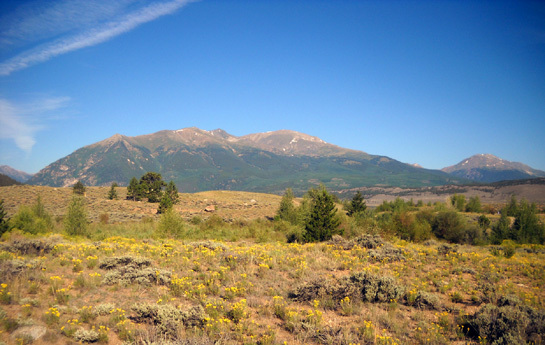 Elbert (L) and Mt. Massive at 6:15 AM. Our truck is under the left arrow. I'm standing on 6th St. The LT100 riders will make a right turn (the other arrow) onto McWethy Drive. Almost every time we've been here we�ve watched the race at this location and it just gets more dramatic each year as the number of participants increases. There are many fewer people than at the start line and you can see the riders better after they're stretched out a little bit. There were at least 200 more cyclists riding this year than last. Due to the large field the riders were put into several �corrals� based on their speed in previous races. 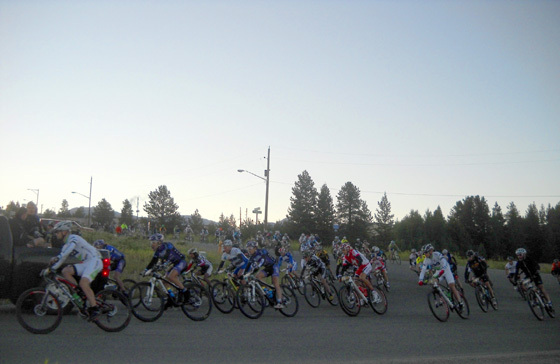 There was also a wave start, with a short period of time between each group of riders being released. This type of start is also used at large foot races like the Boston Marathon and Peachtree Road Race. It is even more important at large bike races. It spreads people out and makes the first miles of the race safer. Faster riders were put in the first corral, slower ones farther back. Because of the wave start it took several minutes for all the riders to cross the start line. It also took longer than in previous years for the riders in the back of the pack to reach us at the turn from 6th to McWethy. The good thing is that the bikes weren�t packed together as tightly on that turn as in prior years and we got to watch a longer show. When the riders were all past us I drove Jim to the corner of 3rd and Harrison, where he met the group going up to Columbine Mine aid station and found someone to ride with. We used to be able to take our own 4WD truck up there, with Cody tagging along (and Tater, when she was alive). We can't get up there in our 2WD Ram so we're dependent on other people now to take us there if we want to work that aid station. No crews are allowed up at Columbine Mine. Lost Canyon Road, the only way up there in a vehicle, is narrow and rough the last few miles to the top. More importantly, it is used by the 1,800+ riders up and back. The aid station volunteers drive up there well before any riders are on the road and leave after they have all come back down. Jim originally wanted me to drive him out as far as our truck can go on Lost Canyon Road on race morning. He planned to ride his bike several miles up the rougher part of the road to the aid station before the race participants got there, work the radio all day, then ride all the way back to the camper after the aid station closed. For various logistical reasons he changed his mind before race day. In retrospect, he probably would have had more fun doing that. Although I've (mostly) enjoyed working up at Columbine Mine several times I decided to help our friend Jack Saunders at the Twin Lakes aid station this year instead. Jack needed the help, I was ready for something different, and it solved the problem of what to do with Cody all day. Cody can't carpool with us in someone else's vehicle up to Columbine Mine and it would be risky to leave him in the camper for 11-12 hours if Jim and I both worked up there. He has done OK by himself for about 10 hours in the camper but more than that is unknown territory. By working a six-hour shift at Twin Lakes I was gone about eight hours and he was fine. Good boy! 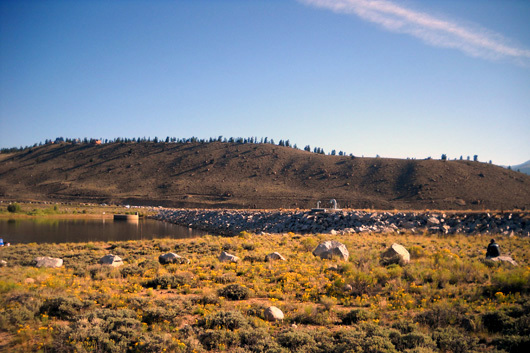 CR 25 leads to the eastern side of the dam and "gauntlet" where crews waited for their riders. I wrote in the last entry about some of the things we did Friday to help Jack get ready for his monumental task of captaining his busy aid station during the race -- filling large tanks of water, gathering traffic cones and safety vests, and collecting all the cyclists' Twin Lakes drop bags in our truck. After letting Jim off in town I drove out to Twin Lakes, arriving right at the designated time of 7 AM. 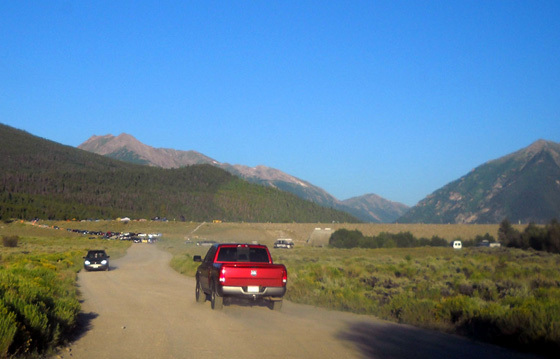 I was in a long line of crew cars traveling from Leadville that were headed for either Twin Lakes or the crewing spot several miles farther south. I've never worked the Twin Lakes aid station for the bike race nor have I been anywhere near it on race day. 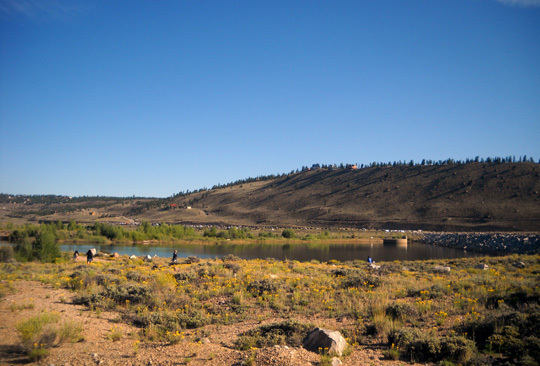 It's located on an elevated strip of land adjacent to the dam at the eastern end of the lakes, not in the Town of Twin Lakes farther west where an aid station is located during the run. 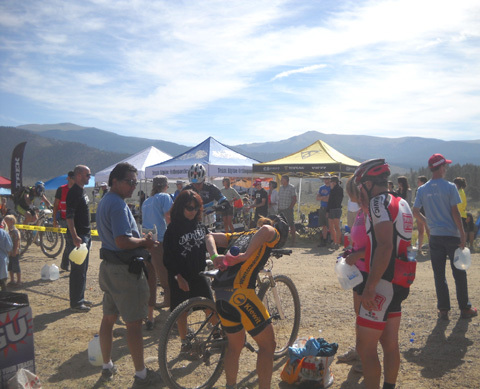 The Twin Lakes bike aid station is easy to locate on race day -- just follow all the other vehicles. Glad I don't have to lug all that stuff up there! The woman on the left is toting three large boxes. Even after talking with Jack and watching the DVD of the race that was filmed last year I was surprised by what I saw when I arrived. It only got worse later. 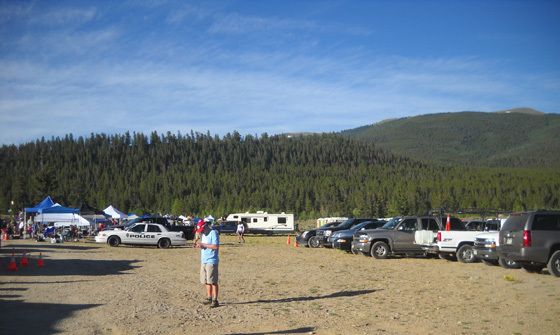 Crew members couldn't drive on the gauntlet but volunteers could use it to reach the parking area behind the aid station. Once I drove up on the gauntlet I had to ask some guys where the aid station was located because it wasn't obvious with all the other canopies. It was several hundred yards to the north, at the end of the dam about a hundred yards from a large inflatable Lifetime Fitness arch. Unfortunately, the aid station wasn't obvious to some of the cyclists the first time they went through the gauntlet, either. On their way back through Twin Lakes at 60 miles several riders told me they missed the aid station and drop bags outbound. Some found out from other riders' crews where it was but by then they were at the other end of the gauntlet and didn't want to lose time back-tracking. That may have contributed to some riders' problem with dehydration in the next twenty miles. More about that later. 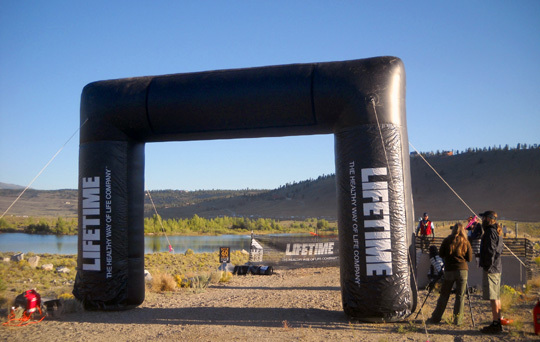 If you ever ride this race with a drop bag and/or without a crew, I'd advise you to go into every aid station slowly and if you don't see the official aid station and drop bag area, start asking people right away where they are located. That can save you some time, a lot of aggravation, and maybe even your race. 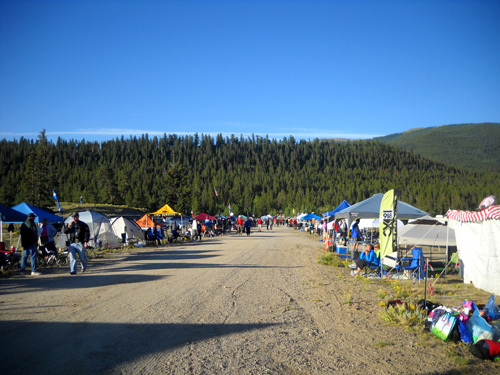 Jack and Cindy got there at 5:30 AM but still had some problems getting their truck and long, open trailer full of supplies to the aid station with vehicles clogging the narrow entrance road and people setting up canopies and chairs along the course. It was obvious that some of the crews either got up extremely early or spent the night out there. 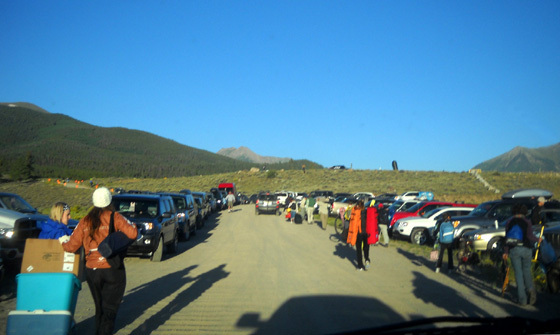 There was enough parking for volunteers behind the aid station during the race. Volunteers who arrived at noon had more difficulty getting to it than I did at 7 AM. The crowd was also a problem for those of us who left before all the riders came through the second time. I imagine some crews left their canopies out there till Sunday morning so they didn't have to lug them so far to their vehicles. By the time I left at 1 PM crew vehicles were parked over a mile away, a long distance to haul as much gear and supplies as some of these people had. That was the start of a frustrating, tiring 6+ hours for me. 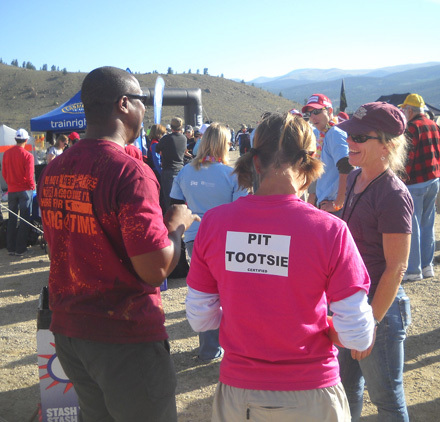 It�s a whole different world up at Columbine Mine aid station, where no crews are allowed. I envied Jim all morning. After several volunteers unloaded all the drop bags from my truck (next picture) I moved it behind the aid station and took a few minutes to get my bearings. 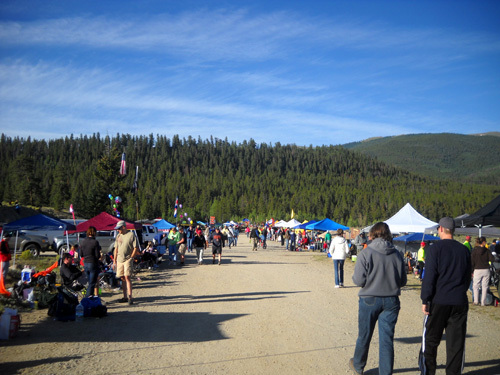 The drop bag area was between the medical tent (L) and aid station (R). The views are very nice from this aid station toward the eastern end of Twin Lakes, the dam, Mt. 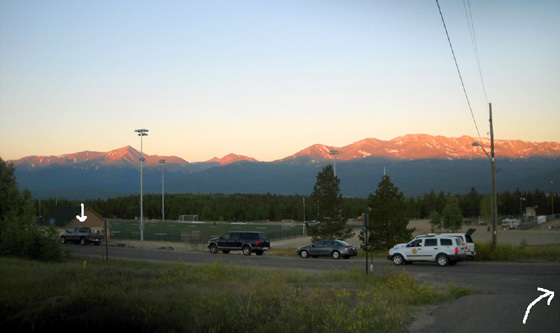 Elbert, and the other surrounding peaks. It�s a good place for young families to hang out while waiting for their riders. Kids and dogs could play in and near the lake and there was a nice breeze to offset the heat of the sun. It's amazing how warm 75 F. can feel in direct sun at 9,200 feet elevation, the lowest point in the race. Even up at Columbine Mine at 12,600 feet it felt quite warm by noon. The area behind the aid station was also a quieter place where I could escape a few times when I became overwhelmed with discourteous, noisy crews. On this out-and-back course riders go through Twin Lakes outbound at approximately 40 miles into the race, climb 3,400 feet in ten miles to Columbine Mine at 12,600 feet (most of that gain is in the last five miles), turn around, zip back down the 3,400-foot descent, and hit Twin Lakes again inbound at about 60 miles into the race. Most of the 1,800+ cyclists have multi-person crews that include family members, friends, and/or teammates. They are allowed at only a few places along the course. "Pit" crews wait for their riders. Twin Lakes is the most popular spot for various reasons and many of the people who crew at Twin Lakes use that as their only crewing point. They arrive early, hang out until their riders come through the first time, hang out some more, then leave after their rider comes through the second time. If a rider wants a crew at Twin Lakes that's about the only practical thing for the crew to do since this race has grown so large. It's too difficult to find a parking spot out there to even consider leaving before the riders come back through at 60 miles, unless they don't plan to return after the rider goes through at 40 miles. When I was taking pictures I noticed a lot of vehicles parked across this end of the lake along paved CO 82 (next photo). Above and below: the dam is on the right. Crews who park over there don't have to deal with narrow, dusty CR 25 and a longer walk, although it's probably more fun for crews to hang out for several hours with everyone on the gauntlet. 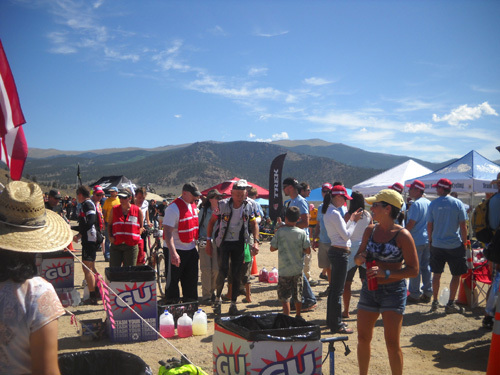 No matter which crew-accessible aid station crews choose, they're in for a tough time during this race. I think it might be easier to ride this race than to crew for it! Crewing for the run at the Twin Lakes aid station in town is also difficult but it's not as chaotic as this place during the ride. By 9 AM there were vehicles lining CO 82 from well north of the dam almost all the way down to US 24, a couple miles total. They also lined the half mile of dirt road on CR 25, where many parked head-in, not just parallel, so more cars could squeeze in. They filled a field and some side roads, too. There must have been several thousand vehicles out there by mid-morning, and even more bodies. �Chaos� describes the scene up on the gauntlet pretty well, too. This quarter-mile strip of the course was a zoo before and during the race. For me, it was more like a nightmare. I guess I'm getting too old for this. Although Jack had a lot of volunteers, he didn't have nearly enough to control this crowd at its peak. The volunteers were so busy taking care of the riders and bikes that most didn't have time to deal with crew members and spectators, too. Thank goodness no one but volunteers and race officials were allowed on the narrow dam itself, which is only open during the bike race and only to the riders. You can�t run, walk, or ride across it on any other day because of security post-9-11. Entry/exit arch to the Twin Lakes crewing point; the dam is to the right. 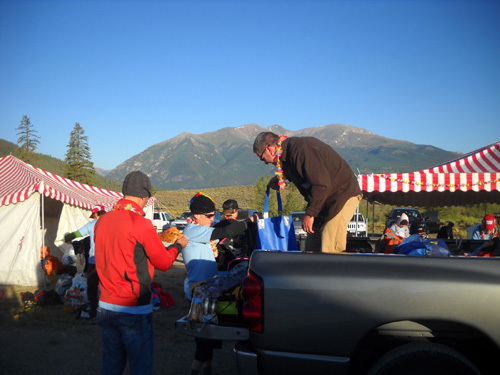 Jack has never captained this aid station before (he used to captain Columbine Mine when we first met him in the early 2000s) and he had only about ten days� notice before accepting the assignment this year. I think he was surprised by the crowd, too. 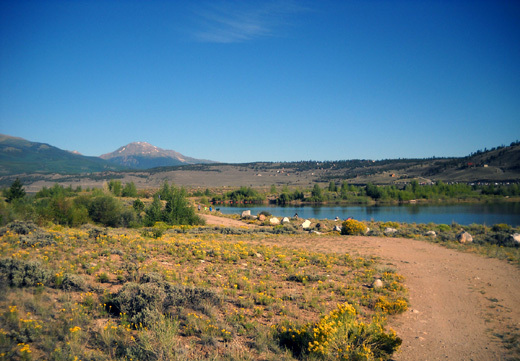 Twin Lakes is an entirely different scenario than Columbine Mine. It�s a good thing Jack and Cindy are pretty laid-back. I�d have gone nuts trying to manage this aid station. I about went nuts just being one of about ~50 volunteers helping them! There was minimal crowd control. There were attempts at crowd control but they were usually either ignored or only temporarily obeyed by the crews. More (preferably large, assertive male) volunteers or security personnel would have been very helpful. 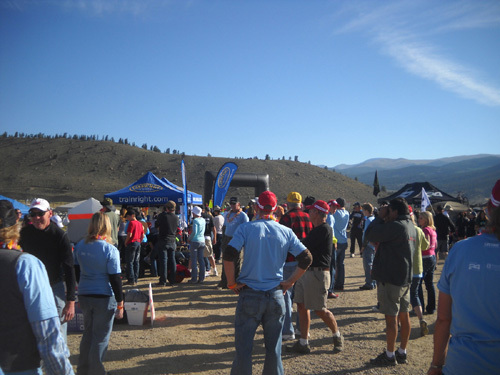 I�ve never been to an ultra running event where crews were this inconsiderate. Some dogs were off-leash, unattended, and pooping anywhere they wanted. Too many kids were unattended and in the way at the aid station and on the course. Inattentive adults crowded the course and got in our way at the aid station and drop bag location, which I was asked to supervise. Yes, I've seen all those infractions at ultra runs, too, but never to this magnitude. After the drop bags were organized and the aid station set up I had a few spare minutes to take a stroll from one end of the gauntlet to the other. I took pictures, talked with some folks, and tried to get a feel for what it would be like to crew if Jim ever does this race. I got back to the drop bag area before the riders began coming in. Several of us kept busy for the next few hours retrieving drop bags for riders without a crew at Twin Lakes, helping them in whatever way we could (except working on bike problems -- that's not permitted), and reorganizing the bags so we could find them when the riders came back through the aid station the second time.